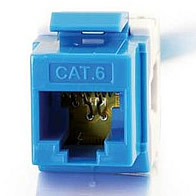 Cat6 RJ45 UTP Toolless Keystone Jack - Terminate without a punchdown tool! Designed for superior performance, this keystone jack is available in several colors to match housing or allow color-coded port designation in compliance with TIA/EIA 568B 2.1 and ISO/IEC 11801 requirements. 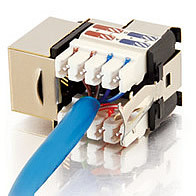 Includes 110ype IDC termination with strain relief caps, and comes standard with 50 µinch gold plating on the jack contacts. Designed for superior performance, this keystone jack is available in 9 colors to match housing or allow color-coded port designation in compliance with TIA-606 requirements. 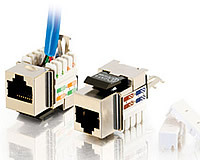 Includes 110ype IDC termination with strain relief caps, and comes standard with 50 µinch gold plating on the jack contacts. 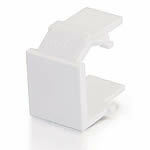 Designed for superior performance, this keystone jack is available in several colors to match housing or allow color-coded port designation in compliance with TIA-606 requirements. Includes 110ype IDC termination with strain relief caps, and comes standard with 50 µinch gold plating on the jack contacts. Please Note: Our keystone jacks will work with our wall plates, or any standard keystone and angled multimedia wall plate or patch panel. Designed for superior performance that meets or exceeds industry standard Category 6/Class E according to TIA/EIA 568B 2.1 and ISO/IEC 11801. 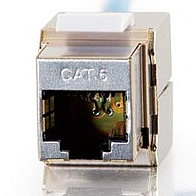 This panelype shielded RJ45 jack comes standard with 50 µinch gold plating on the jack contacts. The 2-piece shielded cover is designed for easy cable installation and protection from external radiated noise. Use for any unloaded keystone wall plate or patch panel. Designed for superior performance that meets or exceeds industry standard Category 6/Class E according to TIA/EIA 568B 2.1 and ISO/IEC 11801. 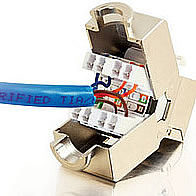 This panelype half shielded RJ45 jack includes 110ype IDC termination with strain relief caps, and comes standard with 50 µinch gold plating on the jack contacts. The shielded top cover is designed for easy cable installation and protection from external radiated noise. Use for any unloaded keystone wall plate or patch panel. Designed for superior performance that meets or exceeds industry standard Category 6/Class E according to TIA/EIA 568B 2.1 and ISO/IEC 11801. 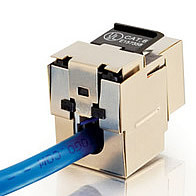 This panelype half shielded RJ45 jack includes 110ype IDC termination with strain relief caps, and comes standard with 50 µinch gold plating on the jack contacts. The 2-piece shielded cover is designed for easy cable installation and protection from external radiated noise. 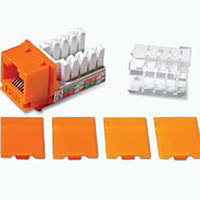 Use for any unloaded keystone wall plate or patch panel. Covers unused ports to keep out dust and debris.